From the beginning of Ben Wheatley’s “High-Rise,” the signs of a disturbing venture are in store for the viewers. 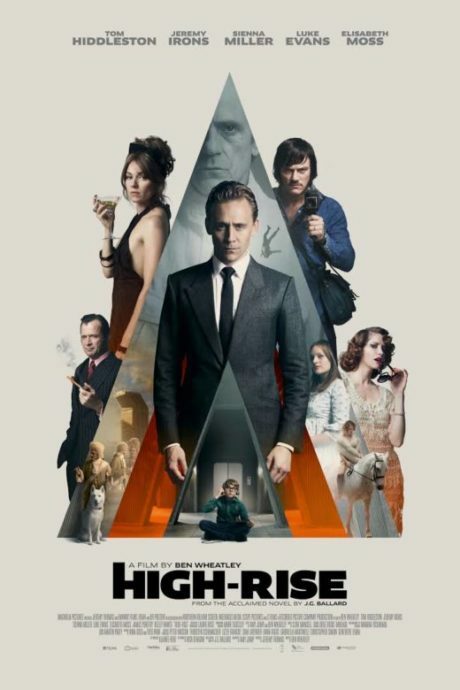 Just minutes into “High-Rise,” the setting backs of three months earlier when a doctor Robert Laing (Tom Hiddleston) after recently losing his sister moves into a spacious apartment on the 25th floor of this futurist high-rise (would be in the 1970s here). (J.G. Ballard’s 1975 novel adapted to silver screen by Ben Wheatley with the same title.) Laing goes on to say he feels he’s living in the future that has already taken place. Whether or not, Laing is aware of what is about to take place in his new surroundings is uncertain. That is, the brutal reality of his other rich neighbors on the upper floors where he joins them starting with frivolous decadence (orgies, drunkenness, drugs, etc.) to out-and-out mayhem. The floors below are where the middle-classes live, however, in simpler and more crowded apartments. Even here–with fewer material goods—they, too, fall into dystopian anarchism just like their opulent neighbors above them. Mr. Laing is no recluse and begins an illicit affair with Charlotte (Sienna Miller) and fools around with Helen (Elisabeth Moss), both are his neighbors. Charlotte and Helen are tied to a mercurial documentary filmmaker named Wilder (Luke Evans), who becomes friends with Laing, soon to be rivals over the two women. The initial gaucherie between the two men, like everything else in this apocalyptic film goes south. Wheatley’s “High-Rise” is not as good or as convincing as Joon-Ho Bong’s science fiction-thriller “Snowpiercer” (2013). 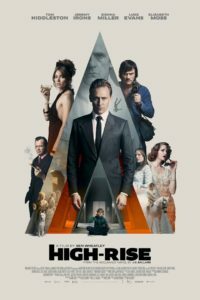 Nonetheless,”High-Rise” is watchable (if a little too disjointed for my liking) and has dutiful parts. Cast: Jeremy Irons (Anthony Royal), Sienna Miller (Charlotte Melville), Luke Evans (Richard Wilder), Elisabeth Moss (Helen Wilder), James Purefoy (Pangbourne), Keeley Hawes (Ann Royal), Peter Ferdinando (Cosgrove), Sienna Guillory (Jane Sheridan) and Daniel Skinner (Simmons). Previous Topic: Stay or Go?